It's about privatization. It's always about privatization. Take a job that a state agency has been or could be doing and give it as a contract (often a no-bid contract) to a private individual, who'll profit plenty while the state saves no money whatsoever. In fact, as in this present case, the state loses money. This case of political corruption investigated by the N&O involves Rep. David R. Lewis of Dunn and Martin Edwards & Associates of Linden, whose president is Rickie Day. Day's company has held a state contract to tow, store, and sell vehicles seized from repeat driving-while-impaired offenders. A vulture business with a vulture protector in the General Assembly. Cars are towed and stored until they are either reclaimed by their owners or the courts seize them and they are sold at auction. Mr. Day's company receives the lion's share of revenue from the towing and storing of vehicles, as well as a fee when vehicles are sold. By law, Mr. Day is required to share some of the revenue with the public school system. Day's company has been pocketing over $1 million a year while school systems across the state split up considerably less than that, about $700,000 in 2014. The State Surplus Property Agency wants to take on this job because it believes it can return more money to the school systems. The vehicles could be sold through the state’s much larger auction site, generating more money, and stored for less cost on state property. 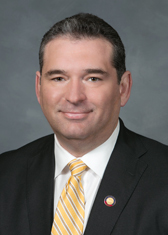 So ... Rep. George Cleveland, an Onslow County Republican, filed a bill last March that authorized the Surplus Property Agency to store, process, maintain, and sell seized cars. On March 31, the House Regulatory Reform Committee signed off on Cleveland’s bill, sending it to the Finance Committee for consideration. April 1, Rep. David Lewis’ campaign received a $5,000 contribution from Rickie Day, president of Martin Edwards & Associates. April 2, Lewis, who chairs the Rules Committee in the House, got Cleveland's bill referred to his committee, where it promptly died. That's about as clear a case of quid pro quo as we've ever seen: put the money right here, and then I take care of your little problem. But Cleveland, chairman of the General Government budget subcommittee, didn't give up. He inserted language from the bill into the state budget. The language would transfer oversight of the seized vehicle program from private contractors to the Department of Administration, which runs the Surplus Property Agency. The General Assembly approved the budget, with Cleveland's language intact, on Sept. 18. What else are we to think but this: when David Lewis gets bought, he stays bought. That should go on his resume.